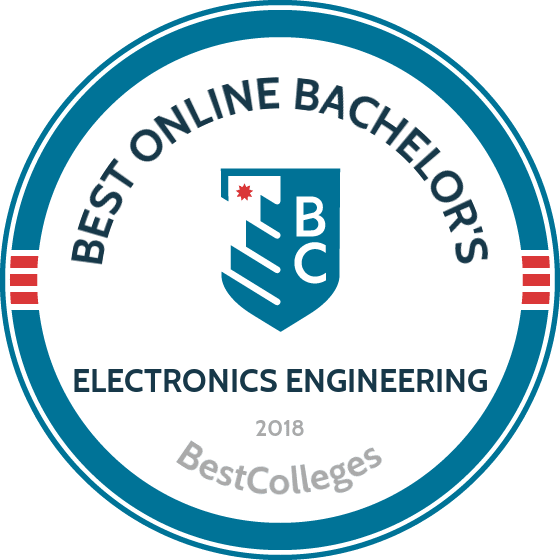 What Are The Best Online Bachelor's in Electronics Engineering Programs? What Else Can I Expect From a Bachelor's in Electronics Engineering Program? Students earning their online bachelor's in electronic engineering learn about the electrical equipment essential to modern industries such as manufacturing, renewable energy, defense, aerospace, and communications. They go on to work as engineers and technicians who develop, test, and maintain the diversity of electronics upon which society depends. Students earning their online electrical engineering degree study the foundations of the discipline, such as analog and digital electronics, DC and AC electricity, and signals and systems. They also learn how to apply this knowledge to large-scale, practical projects, such as wind farms, power grids, and aerospace travel. The growth of renewable and alternative energy have created a high demand for electronics engineers. The Bureau of Labor Statistics projects that employment for wind turbine technicians will grow by 96% between 2016 and 2026. Some schools expect their online students to have experience in the field or be currently employed as engineers. Depending on the program, students complete a capstone or internship requirement that involves the development of electronic equipment. If you love to tinker with electronics, an online electrical engineering program may be the perfect fit for you. Clemson is a public research university located in Clemson, South Carolina. The school offers several distance learning programs, including a 126-credit bachelor of science in electrical engineering. This rigorous program only admits full-time employees engaged in engineering work. This degree completion program combines online courses at Clemson with prerequisite courses that students must transfer in from another institution. This online electrical engineering degree includes courses on electric circuits, signals and systems, microcontroller interfacing, and random signal analysis. A notable course on robots and society examines the increasing role of robots, their economic impacts, capabilities, and technologies used to build them. Courses are delivered asynchronously online, though students take tests on-campus or remotely with approved proctors. Admission requirements include prerequisite engineering courses with a minimum "B" average and strong math skills. This program is accredited by the Engineering Accreditation Commission of ABET. Located in Tempe, Arizona, ASU offers an online bachelor of science in electrical engineering (BSE) that prepares students to become engineers in sectors such as energy production and distribution, sustainable development, and information processing and management. This 12-credit program is taught by award-winning faculty who integrate theoretical engineering fundamentals with practical experience. ASU's electrical engineering degree covers a wide range of topics, including circuits, electromagnetics, signals and systems, properties of electronic materials, and energy systems and power electronics. Lab courses delve into the design process and industry tools with topics such as conceptualization, research, specifications, simulation, and the implementation and evaluation of designs. Distance learners have access to academic resources like tutors and success coaches. Admission requirements include high school math and science proficiency, competitive SAT or ACT scores, and a minimum 3.0 GPA on credits transferred. This program is accredited by the Engineering Accreditation Commission of ABET. Stony Brook offers a 120-credit bachelor of science in electrical engineering through the College of Engineering and Applied Science that allows students to work full-time while earning their degree. The curriculum provides upper-division courses for the four-year degree, most of which are delivered asynchronously online. Core courses cover topics such as electronics, signs and signals, electromagnetics, semiconductor devices, and digital logic and design. A year-long capstone exposes students to many design challenges they will face in the field. Some courses with lab components may require synchronized sessions with instructors. Admission requirements include a minimum 3.0 GPA on prerequisite courses such as calculus, differentiated equations, electric circuit analysis, and electric circuit analysis from a regionally accredited institution. This bachelor's degree in electronics engineering technology is accredited by the Engineering Accreditation Commission of ABET. Since 1972, Thomas Edison State University (TESU) programs have specifically served nontraditional learners. The school's 124-credit bachelor of science degree in electronics systems engineering technology enrolls technologists employed in fields such as avionics, computer hardware, and instrumentation and control. Students enroll in 60 credits of general-education requirements on topics such as calculus, physics and computer programming. Major course work includes the study of electrical circuits, communications electronics, and electronics instrumentation and control. Students must also complete virtual hands-on and software simulated labs in microprocessors, digital electronics, solid-state devices and linear/integrated circuits. TESU students must also complete a Capstone project, which is an in-depth, student-centered activity that requires the integration of theory and practical experience. Students will apply the skills and techniques they have learned to a specific project. The project will identify a real-world electronics engineering technical problem, issue or event developing technology, or a case study in which the student will conduct research by exploring, evaluating and theorizing a solution in a final paper. Applicants must be 21 years or older and have a high school diploma or GED to be considered. Individuals not meeting this criteria, but who feel they warrant special consideration for other reasons, may petition the director of Admissions and Enrollment Services and present appropriate documentation to support their being accepted to the University. Students admitted through special consideration are subject to the same academic policies and requirements as those admitted unconditionally. This program is accredited by the Engineering Technology Accreditation Commission of ABET. UND is North Dakota's oldest college and offers 40 distance learning programs, including a 125-credit bachelor of science in electrical engineering. This program is designed for working adults and can be completed in six year of part-time study and can be completed either entirely online or on-campus at the Grand Forks campus during the summer terms. General-education requirements include classes on chemistry, physics, calculus, and an introduction to electrical engineering. The curriculum includes courses on topic such as electronics, circuits analysis, signals and systems, electric and magnetic fields, and control systems. There is also a two-semester capstone that emphasizes design methodologies, teamwork, and advanced communication. Students work in teams to design, build, and test an electronic system prototype. Admission requirements include a high school diploma or GED and SAT or ACT scores; transfers with 24 or more credits must have a minimum GPA of 2.0 to be considered. This program is accredited by the Engineering Technology Accreditation Commission of ABET. Students earning their online bachelor's in electronics engineering can expect certain courses in their curriculum, including fundamentals of electromagnetics, signals and systems, and circuits. However, different programs may focus on different aspects of electronics engineering or subdisciplines in the field and may therefore offer unique electives courses or capstone projects. Despite some differences between programs, key foundational courses in electronics engineering should appear in most online electrical engineering bachelor's degree curriculums. Below, you will find a list of sample courses and the occupational skills they provide. Fundamentals of electromagnetics: This course provides students with a survey of the foundational elements of electromagnetism required for most electronics engineering professions. Students explore concrete topics in magnetic materials, vector analysis, Fourier analysis, vector fields, electro/magneto statistics, and Maxwell's equations. Signals and systems: Using real data and problems, students learn to apply their knowledge of signal reconstruction, modulation, filters and applications, Fourier analysis, Laplace transform, and z-transform. Signals and systems play a role in a variety of professional contexts, including defense electronics, communications, speech processing, consumer products, and seismic data processing. The course also emphasizes the importance of critical thinking and problem solving skills. Electronics: Students learn the fundamentals of circuit design and analysis by exploring topics in diode theory and circuits, transistor biasing, AC models, voltage amplifiers, and semiconductors. As a whole, the course provides students with the skills necessary to work with the more complicated electronics required in most electronics engineering professions. How Long Does It Take to Get a Degree in Electronics Engineering? Most programs require around 125 credits of coursework. Depending on factors like transfer credits and the size of course load per semester, students can earn their degree in around four to six years. Whether you enroll on a part-time or full-time basis will also affect the amount of time it takes to earn your degree. Some programs also offer summer enrollment so that students can earn credits year-round. Some programs allow students to take courses asynchronously, meaning they can advance through the work whenever it is convenient for them and at their own pace. Other programs follow a cohort format in which students advance through their degree at the same pace as their peers, thus limiting their scheduling flexibility but providing a support group of peers and a platform for future professional networking. When a school is accredited, it means that an accrediting agency has reviewed and approved its programs and determined that the school meets a predetermined standard for education quality. While regional accreditation is typically considered more prestigious than national accreditation, both forms of accreditation inform students that the program has been officially reviewed and will provide a quality education for the cost of its tuition. Common regional accrediting agencies are the Northwest Commission on Colleges and Universities and the Higher Learning Commission. It is important to always check to see whether a school is regionally or nationally accredited. It is also wise to check the name of the accreditation agency and make sure it matches the name listed on the U.S. government's list of agencies, as sometimes agencies with similar-sounding names will try to pose as legitimate agencies. When it comes to online electronic engineering bachelor's degrees, the programmatic accrediting body is the Engineering Accreditation Commission of ABET, a globally recognized standard in the field that has accredited engineering programs for almost 100 years. The U.S. Department of Education (ED) is a government agency that oversees education in the U.S. and provides the public with a list of all approved accreditation agencies. The Council for Higher Education Accreditation (CHEA) is made up of more than 3,000 universities and 60 accreditation agencies, advocating for educational quality through accreditation. Together, both organizations ensure that American universities provide students a fair, quality, and affordable education for the cost of their tuition, protecting students from scams and underperforming institutions. You can explore a list of all accredited schools on either the ED's or CHEA's websites. Those who earn a bachelor's degree in electronics engineering enter careers that pay an average median salary that is equal to or greater than the median salary nationwide. Salaries are highest in coastal areas like New England and California where industry leaders compete to hire electronics and electrical engineers. Those who earn an electrical engineering degree can pursue a variety of exciting career paths that make use of their skills. Industries that most commonly need electronics engineers include aerospace, manufacturing, the federal government, renewable energy, communications and broadcasting, and medical monitoring equipment. Degree holders can focus on the development and design of electronics or on the repair, diagnostics, testing, and maintenance of electronics equipment. Most of these professions can be done indoors but some, like wind turbine technicians, require travel and outdoor work. Electronics engineers develop, design, program, and maintain electronic equipment used in a variety of industries, including alternative energy, communications and broadcasting, defense, and manufacturing. Aerospace engineers design, research, and test electronics used in aircrafts, spacecrafts, missiles, and satellites — essentially any industry that involves flight. Today's aerospace industry is especially interested in developing aircrafts that are more fuel efficient and produce less noise. Many aerospace engineers work for the federal government, in manufacturing, or for private aerospace companies. Electrical and electronics engineering technicians design, develop, test, diagnose, and repair electronic equipment for a variety of industries. They often help companies evaluate electronic products, such as medical monitoring equipment, communications equipment, navigation devices, and automation equipment. Wind turbine technicians repair, maintain, and install wind turbines throughout the country. The job requires technicians to work outdoors and climb to extreme heights in order to access wind turbines. With increasing investments in renewable energy and wind farms specifically, wind turbine technicians will become increasingly sought-after over time. Broadcast and sound engineering technicians install and maintain the electronics equipment necessary for the production of radio shows, television broadcasts, movies, concerts, plays, and other live performances that rely on audio. They most often work in recording studios but can also work at schools, arenas, or concert halls. Professional organizations advocate for research and industry standards in the electrical engineering and energy technology fields. Some of these organizations host conferences, publish papers and journals, and offer career development opportunities and resources like job boards. Others focus on research initiatives and policy changes that affect the industry at large. Most importantly, these organizations provide professionals and recent graduates with networking opportunities and provide a platform for communication with others working in their sector. IEEE is a global community of engineers from over 160 countries. The organization hosts conferences, publishes papers, and functions as a voice for the industry as a whole. IET is a multidisciplinary community of engineers and technology workers that influences policies and standards in the field. The organization also offers career development opportunities and resources. EPRI spearheads research and initiatives that help develop innovations in the electricity sector for the benefit of electricity workers and society as a whole. Students hoping to earn their bachelor's degree in electronics engineering technology online have a few options to assist with the cost of tuition. If you are currently employed, check your employer's human resources benefits to see whether you are eligible for employer-based tuition assistance. Some schools also offer tuition assistance for veterans and active military members or merit-based scholarships, which is why it is important to check individual programs for program-specific funding opportunities. It is also wise to complete the Free Application for Federal Student Aid (FAFSA) form in order to receive information about different types of federal funding, such as loans, grants, work-study, and scholarships.